OFSMk2 is a low price sensor for visibility. The power consumption is low. The main application is for traffic purposes. Using so called backscatter technique it measures the amount of water particles i e fog in the air that limit the visibility. 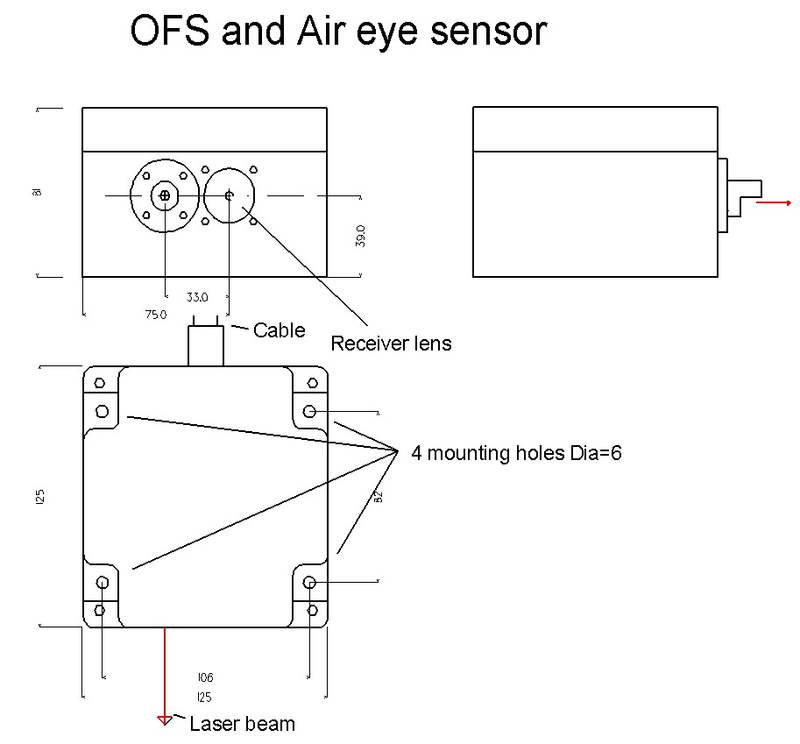 The sensor is used at different places for different applications. The validity and the stability has been good in all cases resulting in satisfied customers. A narrow beam of red laser light comes out of an opening on the front. A detector behind a lens in another opening is sensitive for incoming laser light in a narrow lobe that overlaps the transmitter beam. If there are fog particles in the overlap zone light will be scattered back and reach the detector causing a signal on the sensor raw signal output. The sensitive zone is located about 30 cm ahead of the sensor and its volume is less than 1 cubic centimeter. More information about different methods to measure visibility can be found on Measuring visibility. The raw signal V is analog and it is a measure of the amount of backscattered light from the overlap zone. So the more fog in the overlap zone the more signal. 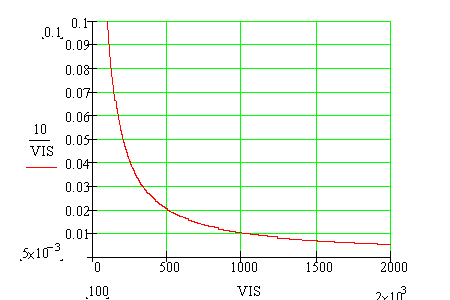 The output voltage V as funcion of the visibility. Expression (2) can thus be used to convert the measured signal V to visibility. If the measured raw signal is too low, lower than noise and temperature drift we can't be sure that there is fog present. Therefore we get an upper limit on the measurable visibility. In the specifications we have set the limit to 5 000 meters. This is somewhat conservative. If the sensor is checked, cleaned and calibrated frequently the limit can be set higher. This also depends on the required accuracy in percent of measured visibility at the higher part of the visibility range. The processed digital output saturate at 10 000 meters visibility but the accuracy is limited above about 5000 meters. In order to get a value of the visibility as experienced by the eyes, mean values of samples from about one minute from the output are taken and processed. If that is not done very large fluctuations in the signal will occur during fog. The reason is probably that there are spatial variations in the particle density that our eyes can't see. The analysis described above is done in an integrated microprocessor. The primary signal is first sampled during one minute and then the calculation according to formula 2 is done. This string can be received by many loggers with RS232 inputs but also by a PC with a terminal program like Hyper Terminal (part of WIN-98) We recommend a freeware called Br@y terminal. The microprocessor can as an option control a potential free semiconductor switch that is opened when the calculated visibility is below a certain value (default is 1000 meters). And the switch is closed when the visibility is higher than that value. The unit should be mounted so that the laser beam is directed approximately north and horizontal, i e sunlight must not reach the detector. The beam should not hit anything within a distance of about 10 meters. 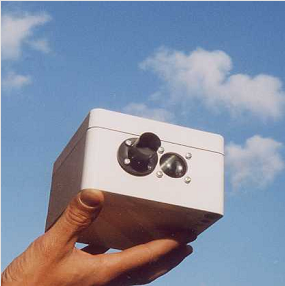 Some simple shield, protecting the sensor from direct sunlight and the lenses from rain, reaching not more than 100 mm in the laser beam direction helps to keep away precipitation from the optics but in most cases the small shield on the sensor front is sufficient. A floating DC 11-15 Volt, min 200 mA power supply is connected on the "Power"-terminal marked plus and minus on the screen print (red and black wire on the standard cable). The outputs are connected to the "Analog" - yellow wire - and "RS232" terminals - green and white -. Texts on the screenprint on the PCB will define the signal found on the respective outputs. Note that separate ground wires are used for signal and power.